Three longtime city officials attended their final council meeting Tuesday. 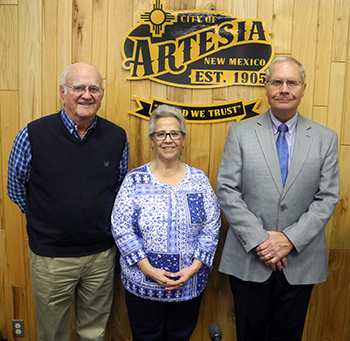 By the next meeting March 13, Mayor Phillip Burch, Councilor Nora Sanchez, and city attorney John Caraway will be enjoying their retirement. The council expressed its appreciation to the trio for their years of work on behalf of the community. Other councilors echoed Hill’s sentiments and also thanked Sanchez and Caraway for their service. Sanchez came out of her initial retirement in September 2016 to fill the seat left empty by the death of former councilor Jose Luis Aguilar. She had previously served on the council for eight years. “Twice I picked up the phone and called (Nora) and said, ‘Would you serve on the city council?’” said Burch, “and once I picked up the phone and said, ‘Would you run again?’ Her initial response in all three of those calls was ‘no,’ and then we had some discussions. Caraway took the position of city attorney in 2002 and will be turning over the reins to his partner in the law firm of Caraway, Tabor and Byers, LLP, Matthew T. Byers. Byers was on hand Tuesday to greet the council. Burch was first elected to the Artesia City Council in 2000 and as mayor in 2008. “The vast majority of it has been nothing but a pleasure,” he said. “We’ve hit a few speed bumps every once in a while, but it’s been interesting how this group coped with it, and in this group I’m including all the staff. “Artesia, N.M., is a special little community. I drug a family around this country from Colorado to Nebraska to Atlanta, Ga., Dallas, Texas, Tampa, Fla., and Toledo, Ohio, before coming back here, and there’s something great about all those cities. But this community has something special, and it’s the people that this group serves. We have some very, very generous folks that live in the city of Artesia. I truly believe that this community is special, and it has been a total pleasure for me to be the mayor. Raye Miller, president of Regeneration Energy Corp., is running unopposed for the mayoral seat in the upcoming March 6 municipal election. In other business Tuesday, the council pulled the Artesia Lodgers’ Tax Advisory Committee’s list of recommended funding requests for approval, with Councilor Luis Florez questioning the omission of funds for Our Lady of Grace Catholic Church’s annual Fall Fiesta. “We have over 50 years of hosting that thing, and the communities of Roswell and Carlsbad attend,” Florez said. “It’s only two days, so most of them drive back to their houses, but as far as spending money in the community, I would differ. Artesia Chamber of Commerce Events and Marketing director Vickie Grousnick was on hand as the liaison between the advisory committee, the applicants, and the council, and stated that the church’s presentation of the event to the committee as a “church fundraiser” rather than a community event played a role in the withholding of funds. “The advisory committee has suggested to the organizers of that event that they look at reorganizing the event to be more of a community-oriented event and to track the participation at the event so they can demonstrate contribution to Lodgers’ Tax,” Grousnick said. She said the committee would be glad to assist the organization in taking the necessary steps to qualify for Lodgers’ Tax funds, which she indicated could still be available to the event this year should those steps be taken in time. A scheduled public hearing concerning the application for a Home Business License by Chris Prutt, CPA, for his residence at 2406 Sierra Vista Road was cancelled, as the applicant withdrew his request. During the public safety portion of the meeting, Mayor Pro Tem Terry Hill asked Police Chief Kirk Roberts how the department and schools were interacting to address situations such as the threat incident that resulted in a two-hour delay Friday for the Artesia Public Schools. Roberts said police, in recognizing the stress the incident had caused students and parents, maintained a presence at the schools even after the threat had been deemed non-credible. He said APD and APS leadership will continue to meet to determine what steps could be taken to improve response should a similar situation occur in the future. City officials also pointed to the success of the department’s School Resource Officer (SRO) program as playing a major role in police’s ability to quickly respond to situations in the schools. The council additionally discussed the city’s participation in the consortium responsible for Roswell-to-Phoenix air service out of the Roswell International Air Center. Unlike the Roswell-to-Dallas air service, which quickly met its stipulated passenger count that negated any need for payments from the involved entities, the Phoenix service has required financial backing from the consortium – albeit in a currently-contested manner. Burch said the contract with American Airlines for the Phoenix flight carried the same requirement as the Dallas service: that 70 percent of the seats be filled. “That flight started very, very slow, and it had a hard time,” said Burch. “It went a number of months before it got to 70 percent, but it did get to 70 percent and was looking good, and then they decided to swap equipment and went to a 70-seater. And now we don’t make the 70 percent. City clerk Aubrey Hobson informed the council the city’s portion of consortium payments could be as much as $67,000 per year should the passenger count not be met. The council elected to approve a three-month extension of its participation in the contract, with a possible payment of $15,000 budgeted for if the passenger requirement is not met. Infrastructure director Byron Landfair informed the council the city had accepted a donation of real property from HollyFrontier. The property is located just north of Eagle Draw on the east side of U.S. 285, a site formerly occupied by Wallace Buggy. The council authorized the mayor to accept that deed and sign it once it is received from HollyFrontier. Landfair also gave the council an update on the Sixth Street renovation project. He says paving work continues to be stalled as the city awaits line installation by the gas company. Once that work is complete, he estimates road crews will need just two additional weeks to complete the section of street. Burch stated he is impressed with the ongoing work on the Artesia Little League and John R. Gray Fastpitch Complex fields at Jaycee Park. Councilor Raul Rodriguez, member of the Recreation Commission, said volunteers over the years with the youth baseball and softball programs have “really gone above and beyond” for the athletes. The city also approved the purchase of 80 acres of property – two 40-acre tracts – in the vicinity of the Wastewater Treatment Plant and authorized city staff to negotiate the purchase of water rights from an individual currently selling. Hill asked how water rights purchases would be funded and was told the city would likely be able to break purchases up into different budget years, with the most immediate purchase to come out of the water fund. In personnel business, the council approved the hiring of Jason Bealer as a wastewater assistant at a pay rate of $2,363 per month; John McDonald, parks foreman, $3,025 per month; Emilio Bustos, uncertified firefighter, $2,482; Colin Prescott, uncertified firefighter, $2,482; Debra Brassos, receptionist/clerk, $2,037; and Luis Almanza, cemetery Equipment Operator I, $2,482. The council also granted permission to advertise and fill the position of wastewater assistant. • a Memorandum of Agreement with the Eddy County DWI Program to file a joint application for CDWI funds. • a sublease between Ralph C. Watts and Canary Drilling Services, LLC, and Canary Production Services, LLC, for Lot 6 of Block 2 of the Artesia Industrial Park, 2405 N. Parkland Ave.
• the resignation of Mark Anthony Fuentes, wastewater assistant, effective Feb. 12. • one police employee’s attendance at the New Mexico State Legislative Session in Santa Fe. • one planning employee’s attendance at the New Mexico Floodplain Managers Association’s Spring 2018 Workshop in Santa Fe. • one fire employee’s attendance at EMS Committee meetings in Ruidoso. • four fire employees’ attendance at the Region 3 EMS Conference in Ruidoso. • a request by the Artesia Police Department for the use of Guadalupe Park from 10 a.m. – 2 p.m. Saturday, April 7, for the annual Child Safety Fair. • Artesia Lodgers’ Tax requests, including the following events: 9-11 Golf Tournament, $3,500 (requested $7,000); City of Champions Classic basketball tournament, $6,750; Lady ‘Dog Invitational softball tournament, $4,450; Artesia High School Rodeo, $4,100; Artesia Invitational baseball tournament, $4,450; Balloons & Tunes, $8,350; Clays Crusher Fun Shoot, $7,200; Cruz’n for Vets, $7,500 (requested $15,000); Eddy County Fair, $18,000; Fourth of July Celebration, $7,500; Mack Energy Select Drive Golf Tournament, $1,000; New Mexico MESA Energy Education Fair, $4,000; Red Dirt Black Gold Festival, $47,100; Smokin’ on the Pecos, $36,850; Star Spangled Dash, $5,000; Wet ‘n’ Wild Tour, $3,000; and Main Event Car Show and Cruise, $11,000; and the following tourism entities: Artesia Arts Council, $51,000; Artesia Historical Museum and Art Center, $30,000; Artesia MainStreet, $25,000; for a total of $179,750 in event funds and $106,000 in entity funds.